You can actually amaze yourself by cooking deliciously perfect zarda recipe like zubaida tariq if you follow her step by step instructions. I used to make zarda with another recipe but I tried this recipe today. Everyone on the table liked it a lot and enjoyed it with tea. Now I always will follow this recipe. In the list of ingredients there is a sugar. But in preparation method there is no use of sugar. Why???? With pulao, Zarda is also give a complete package that is why I am noting the method of preparing Zarda. 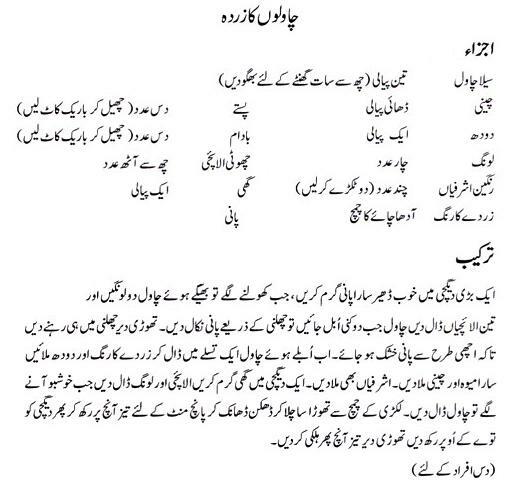 I think this recipe is suitable to make zarda because the ingredients are good. Zarda recipe one of the most popular traditional South Asian desserts of Pakistan. Zarda comes from Persian, and Urdu word ‘zard’ that means yellow. This name is therefore given due to yellow colored rice. Preparation of this amazing dessert requires boiled rice with orange food color, milk, sugar as the main ingredients. For decoration of Zarda raisins, almonds, pistachios, and cardamoms are used. Zarda Recipe by Zubaida Tariq is perfect to be served at your dining table. Mutanjan is also a variation of Zarda and is equally liked by masses. Zarda Recipe by Zubaida Tariq can be prepared at home and served at dinner parties as a dessert. Try it and do let us know how it turned out to be.